I also like the ambush skill as well because almost any player can do it but it requires a forest to hide. What amazing about this skills is that you lose no units and can sometimes cause confusion towards your opponent. It's great for gorilla tactics because you can use this tactic multiple times in one turn if you have high enough AP but you require two forest next to each other. I play lu xun at 227 is there any event that i can get?hopefully battle of shiting. I had something strange just happen recently that hasn't happened before. I was playing under Liu Yong, serving as prefect of Jiang Ling when the event for Yuan Shao dying and his sons splitting their forces happened. After this event, a prompt would frequently come up. I should have taken a picture, but it was a prompt to do repair (and sometimes other domestic work) for the city of Nan Pi. In the prompt there would be a list of officers under Yuan Tan, who I'm assuming were being tasked with the work, and the option given to me to accept or refuse. It was pretty vague, I'm assuming I was asked whether those officers should do the work or not. Liu Yong had no relations with Yuan Tan, and the prompt stopped coming up after Yuan Shang took Nan Pi. Has anyone else experienced this prompt? *I just loaded up the save and the prompt started to to appear in Bei Hai (the last city Yuan Tan hold). I managed to take a pic of it. I am not sure if you figure it out already or not but that prompt usually appears when you are at domestic location and you are talking to one of your close officers. Domestic location meaning farm, market, blacksmith, gate, or order house. Your relationship must be at "Trust" or "Close" for this prompt to appear when you are talking to any officer at these locations. The officers are basically asking you to help them with their duty and this can increase the point to whichever domestic duty he is doing and there is no extra cost but it will take some time away from whatever you are doing. If you refuse you won't be penalized in terms of decreasing your relationship with other officers. I generally do it when I am not a sovereign or prefect. That isn't the same prompt, though I know the one you are talking about. In that play through I wasn't an officer under Yuan Tan (I was serving Liu Yong). The prompt would appear no matter where I was, and as you can see it was related to Yuan Tan's officers and the city he owned. In the pic I posted you only see one officer, but most of the time there would be a few officers in the list. So I played this game for the first time since like 2005 or 2006. I had remembered how cheap Campaign mode is (which isn't necessarily a bad thing if, say, you're bored of your game and want to beat it quickly); I remembered how quickly 15 years could pass without you having moved from your city, free officers being discovered, or other officers gaining deeds; I remembered the side quests - but what I didn't fully remember was just how funny the dialogue is. I think with the quests it's intentional but with the generic/friend dialogue it's probably unintentional. I mean, I guess it depends on who you're playing as if it's funny or not, but . . . the PC is kind of on the dumber side of happy-go-lucky . . .
. . . and your ruler is really bored and lonely. It must be my 47 CHA. Look at those droopy little eyes. Ha ha ha. I'm glad I'm replaying it . . .
Haha! 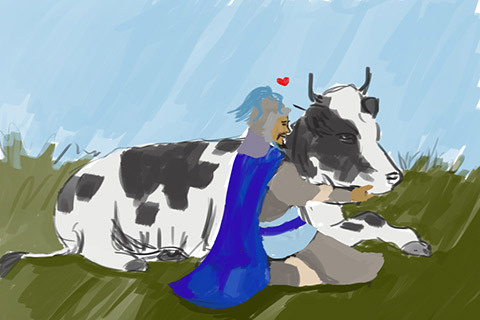 That was a great read and that might be the strangest fanart I have ever seen for Romance of the Three Kingdoms. Ah, the end of classic Yu Jin, I still have no idea why Koei decided to throw away the awesome design they had for Yu Jin since RTKVII and give him a more... barbaric appearance in RTKXII-XIII. The cow eye thing stuck with me after I first saw it. Famous scholar needs some money? "Haha droopy eyes". Xu Yuan wrote: Haha! 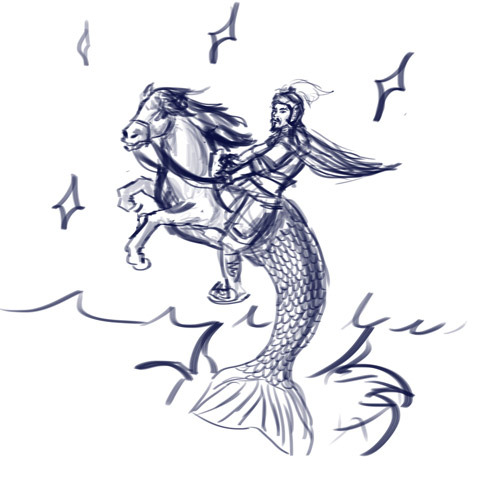 That was a great read and that might be the strangest fanart I have ever seen for Romance of the Three Kingdoms. A lot of people's portraits went badly in XII. Look at He Jin for another example. As for RTKXII-XIII, you're referring to this one, correct? I'm actually annoyed - though not surprised - that he didn't get a new portrait for XIII (much less a set of special portraits), not even in the PUK. 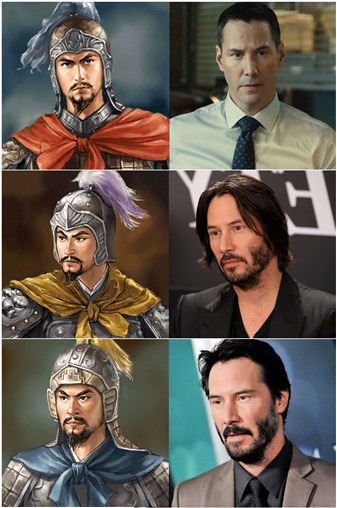 I mean okay, the games are based on the novel, but he's the only one of the Five Wei Generals without it. I have veered far beyond an acceptable range for off-topic discussion; I apologize. Gray Riders wrote: The cow eye thing stuck with me after I first saw it. Famous scholar needs some money? "Haha droopy eyes". Same . . . I had just completely forgotten about it. When I saw it again, the memories flooded back. Last edited by CaTigeReptile on Tue May 02, 2017 7:56 pm, edited 1 time in total. Heh, I recall that exact phrasing from playing RTK X and thought that was a really weird line. I'm glad to see that you made it into reality. Now I can say that is the strangest fanart of RTK I have seen. 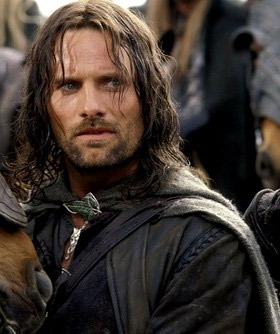 If only Yu Jin looked as good as Aragorn. He hardly looks Chinese due to his enormous nose and really, really small eyes. Also he is the only one of the Five Grand Generals not to have a helmet, but wears his hair out, which is highly impolite. I think DW did better in implementing Yu Jin's attitude through his appearance.